Yesterday my friend Hauke and I theorized about a kind of dream scenario- a totally distributed, easy to use, publication liberation system. This is perhaps not feasible at this point . Today we’re going to present something that will be useful right now. The essential goal here is to make it so that anyone, anywhere, can access the papers they need in a timely manner. The idea is to take advantage of existing strategies and tools to streamline paper sharing as much as possible. Folks already do this- every day on twitter or in private, requests for papers are made and fulfilled. Our goal is to completely streamline this process down to a few clicks of your mouse. That way a small but dedicated group of folks – the Papester Collective – can ensure that #icanhazpdf requests are fulfilled almost instantly. This is a work in progress. Leave comments on how to improve and further streamline this system and join the collective! Click: Here you can find more detailed instructions. Dropbox: Cloud storage system to seamlessly share files with anyone without login. That’s it! Now you can just click request links, click the Zotero get PDF button, and CTRL+V a dropbox direct download link in response! 1.The fundamental problem: uploading huge repositories of scientific papers is not sensible for now. It’s too much data (50 million papers * 0.5-1.5 megabytes together make up ~ 25-75 Terrabytes) and the likelihood for every paper to be downloaded is more uniformly distributed than with files traditionally shared like music. For instance, there are 100 million songs x 3.5 mb songs, and it is difficult to find exotic songs online – some songs have decent availability now because there are only a few favourites – not so with favourite papers. Also, fewer people will share papers than songs, so this makes it more even more difficult to sustain a complete repository. Thus, we need a system that fufills requests individually. Disclaimer: Please make sure you only share papers with friends who also have the copyrights to the papers you share. Could a papester button irreversibly break down the research paywall? A friend just sent me the link to the Aaron Swartz Memorial JSTOR liberator. We started talking about it and it led to a pretty interesting idea. As soon as I saw this it clicked: we need papester. We need a simple browser plugin that can recognize, download and re-upload any research document automatically (think zotero) to BitTorrent (this was Aaron’s original idea, just crowdsourced). These would then be automatically turned into torrents with an associated magnet link. The plugin would interact with a lightweight torrent client, using a set limit of your bandwidth (say 5%) to constantly seed back any files you have in your (zotero) library folder. Also, it would automatically use part of the bandwidth to seed missing papers (first working through a queue of DOIs of papers that were searched for by others and then just for any missing paper in reverse chronological order), so that over time all papers would be on BitTorrent. The links would be archived by google; any search engine could then find them and the plug-in would show the PDF download link. Once this system is in place, a pirate-bay/reddit mash-up could help sort the magnet links as a meta-data rich papester torrent tracker. Users could posts comments and reviews, which would themselves be subject to karma. Over time a sorting algorithm could give greater weight to reviews from authors who consistently review unretracted papers, creating a kind of front page where “hot” would give you the latest research and “lasting” would give you timeless classics. Separating the sorting mechanism – which can essentially be any tracker – and the rating/meta-data system ensures that neither can be easily brought down. If users wish they could compile independent trackers for particular topics or highly rated papers, form review committees, and request new experiments to address flagged issues in existing articles. In this way we would ensure not only an everlasting and loss-protected research database, but irreversibly push academic publishing into an open-access and democratic review system. Students and people without access to scientific knowledge could easily find forgotten classics and the latest buzz with a simple sort. We need an “research-reddit” rating layer – why not solve Open Access and peer review in one go? Is this feasible? There are about 50 million papers in existence. If we estimate about 500 kilobytes on average per paper, that’s 25 million MB of data, or 25 terabytes. While that may sound like a lot, remember that most torrent trackers already list much more data than this and that available bandwidth increases annually. If we can archive a ROM of every videogame created, why not papers? The entire collection of magnet links could take up as little as 1GB of data, making it easy to periodically back up the archive, ensure the system is resilient to take-downs, and re-seed less known or sought after papers. Just imagine it- all of our knowledge stored safely in an completely open collection, backed by the power of the swarm, organized by reviews, comments, and ratings, accessible to all. It would revolutionize the way we learn and share knowledge. Of course there would be ruthless resistance to this sort of thing from publishers. It would be important to take steps to protect yourself, perhaps through TOR. The small size of the files would facilitate better encryption. When universities inevitably move to block uploads, tags could be used to later upload acquired files quickly on a public-wifi hotspot. There are other benefits as well- currently there are untold numbers of classic papers available online in reference only. What incentive is there for libraries to continue scanning these? A papester-backed uploader karma system could help bring thousands of these documents irreversibly into the fold. Even in the case that publishers found some way to stifle the system, as with Napster the damage would be done. Just as we were pushed irrevocably towards new forms of music consumption – direct download, streaming, donate-to-listen – big publishers would be forced toward an open access model to recover costs. Finally such a system might move us closer to a self-publishing ARXIV model. In the case that you couldn’t afford open access, you could self-publish your own PDF to the system. User reviews and ratings could serve as a first layer of feedback for you to improve the article. The idea or data – with your name behind it – would be out there fast and free. Another cool feature would be a DOI search. When a user searches for a paper that isn’t available, papster would automatically add that paper to a request queue. This is a thought experiment about an illegal solution and it’s possible consequences and benefits. Do with it what you will but recognize the gap between the theoretical and the actual! 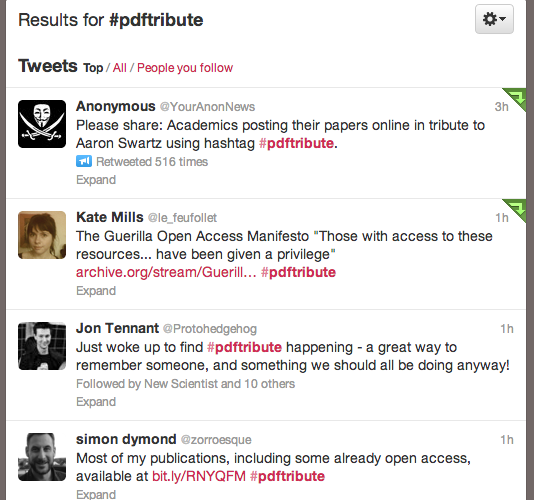 Eva Vivalt coined the #pdftribute hashtag, and helped bring anonymous onboard. Currently there are hundreds thousands of authors posting their PDFs. It’s amazing to see that the original promise of the internet – the spread of ideas- is thriving. Lately i’ve been feeling a bit pessimistic, worried that the net was becoming an overly gamed, astroturf-ridden meme-preserve for advertisers to groom to their financial needs. It’s great to see that the most exciting power of our newfound connectivity- driving ideas to spread freely and have impact without the restrictions of traditional hierarchical barriers- continues to thrive. I hope #pdftribute lives on in both force and spirit, and that we can all begin working toward a world in which all publicly funded research is available to anyone with net access. For those of you who don’t feel comfortable violating your copyright, but want to join in #pdftribute, your best bet is to check the specifics of your publisher agreement. Most journals allow you to upload a pre-print manuscript to your personal website. Then you can go ahead and tweet the link to your website or the individual pre-print PDFs. Jonathan Eisen has a helpful list of 10 ways to post your papers on twitter here. Otherwise, hide in the swarm today as a show of support for Aaron. By standing together we show that the future of research publishing is freedom of information. But tomorrow remember that we need to push through real copright reform. You can start by reading Aaron’s wonderful Guerilla Open Access Manifesto. If you are ready to commit to open access, you can sign the petition at http://thecostofknowledge.com/. There is also this We The People petition demanding legislation requiring journals to use an open-access publishing model Woops that petition has expired- start a new one!. As Matthew Green put it, lets push for an Aaron Swartz copyright reform act. If I may make a humble suggestion- it may be useful to follow a specific format for sharing your papers. This will make them easier to find later, and for journalists to compile some sharing stats. Here is my suggested example. Eva Vivalt reports #pdftribute getting 500 tweets/hr, >2.5 million impressions! © Micah Galen Allen and micahallen.org, 2018. Unauthorized use and/or duplication of this material without express and written permission from this site’s author and/or owner is strictly prohibited. Excerpts and links may be used, provided that full and clear credit is given to Micah Allen and micahallen.org with appropriate and specific direction to the original content. © Copyright Micah G. Allen 2009-2018. All Rights Reserved.